Nah, I'm not that crunchy. 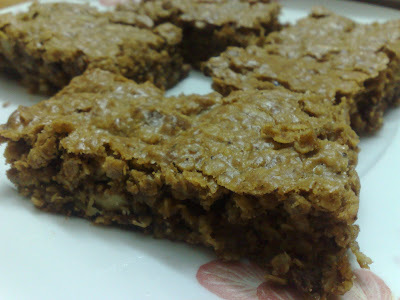 I made these Granola Bars last night and they came out so delicous. They are chock full of oats, walnuts, chocolate chips, raisins and sunflower seeds. Here's the recipe, from good old RecipeZaar. They're called Triple Threat Oatmeal Bars. The recipe called for coconut but I put chocolate chips instead. Healthy, huh? They're still a pretty hearty snack and the kids and my mom loved them! It's the best combination:yummy and healthy *_*! The Mrs, Thanks, we really did. Ms M, lol, I didn't even think of that. I also wanted to say,thanks for posting pictures from your Egypt tour.I really,relly enjoyed those posts :)! Thanks Jasmina, I'm glad you liked them! and I invite you to do the same. It`s all about how to select a proper partner utilizes your funds in a right way - that`s it!. mmmm... that looks yummy, i will check it out, but i wanted to ask how i could follow ur blog, i want to follow it but i can't find the follow box, and the navbar is hidden. What now?? also pls check out my blogs if u have a chance and tell me wat u think. oops sorry i found it. it wasnt working the first time, but i am now following.